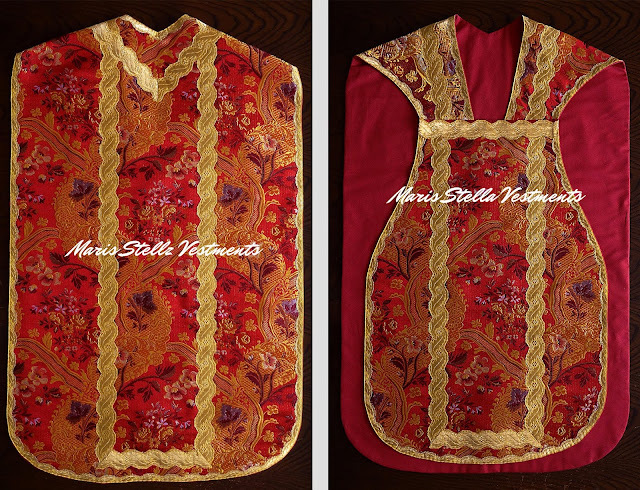 Continuing on with our project of highlighting some of the active options out there for the liturgical arts, and specifically with our recent focus on vestments, LAJ readers of baroque inclinations may be interested in the work of Maris Stella Vestments based out of the UK. Here are two of her Roman sets that I particularly like with some comments below. This sort of baroque-inspired white floral textile is often used for Marian feasts though it is also quite apt for Easter with its spring-like theme. I particularly like the magenta and turquoise highlights in this piece; it sets off the gold trim quite nicely. A very joyful, festive vestment. The cut and general proportions also looks as though it would wear quite well and the same can be said of the next chasuble. The silver, wavy braid utilized in this violet piece strikes a nice note of ornamentation in an otherwise sober vestment. I have often advocated the use of silver trims and deep purple for a time like Lent. While there is no such formal distinction in the Western liturgical tradition of course (anymore than any formal floral association with Marian feasts) I have always felt that this sort of combination is symbolically quite appropriate for Lent. 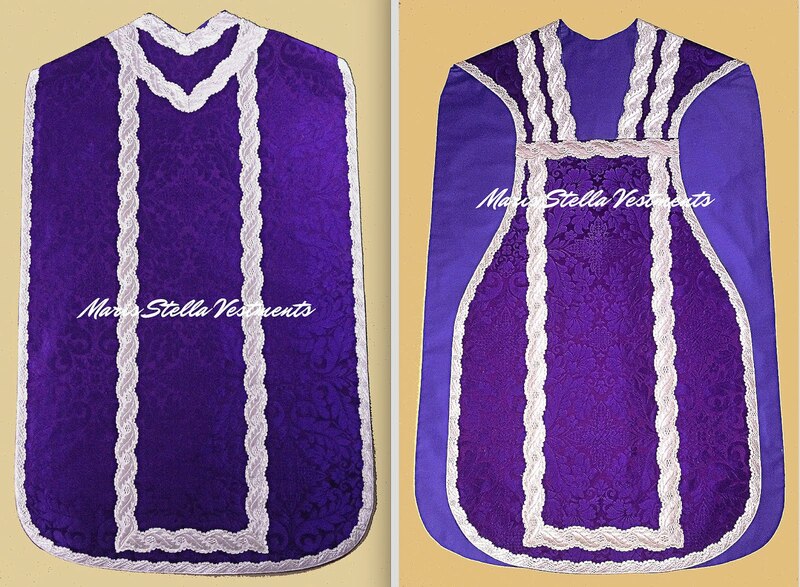 This would be particularly so if other violet times of the liturgical year like Advent and the pre-Lenten time of Septuagesima were to utilize a lighter purple (what the Ambrosian rite calls "morello") and gold trims. While not a requirement, it goes without saying, this can be a nice, symbolic way of speaking to the different seasons in the same way that floral symbols speak well to Marian themed feasts. There is one other set from this company that I'd quickly point to. 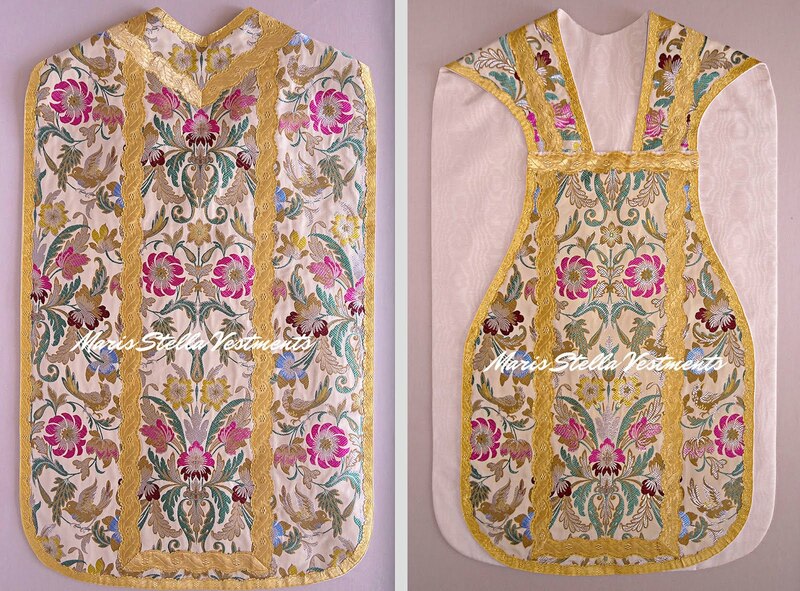 The chasuble itself is nice enough as well, but it is the stole, maniple, burse and chalice veil design the I particularly want to speak to here. Often vestment making can go one of two ways for the designing the crosses that are traditionally placed upon these. One is as shown here above, by use of the same trim overlaid in the form of a cross. The other common way you will see this done today is by utilizing some sort of appliqué. In my experience the appliqué method rarely comes off particularly well, whereas the method seen above is traditional, beautiful and harmonious with the rest of the vestment. 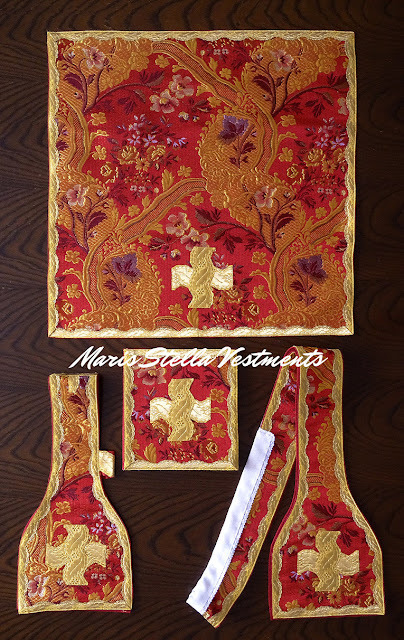 For those of you who are commissioning your own vestments, whether in this style or in other styles, I would highly recommend you opt for this method.